We grow 35 acres of fresh produce right here in Lino Lakes at Waldoch Farm, we are able to use our experience to help select the right varieties of vegetables for your garden. We trial grow our Peppers, Tomatoes, Cucumbers, Melons, Winter Squash, Cabbage, Kales, Broccoli, Brussels Sprouts, Cauliflower, and more right here on the farm. Our vegetable starts are grown for you in the same conditions used for our transplants that get planted directly into our fields. We grow a wide variety of vegetable starts to make us your essential stop when deciding what to plant into your vegetable garden. We have the right tomato for you! There are tomatoes of all types Canners, Romas, Slicers, Cherry, Grape, and more colors, shapes and sizes. With over 40 varieties from heirlooms to hybrids, there will be one to match your tastes. 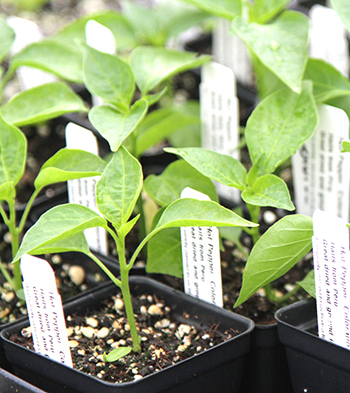 We grow 19 different varieties of sweet peppers and 18 hot pepper varieties. Stop by in the spring and early summer to see our selection. Most of these varieties are also grown in our produce fields. In season, you can come try them out from our fields before you plant them in your personal garden. At Waldoch Farm we have a wide variety of seeds, onion sets, seed potatoes and vegetable plants. Some of the started plants are; Summer Squash, Cucumbers, Kohlrabi, Cabbage, Broccoli, Eggplant, Peas-in-a-Pot, Pole Beans, Melons, Winter Squash, and Pumpkins. Straw is available self service. For a gift card or honey during our off season call 651-780-1207. We grow 35 acers of produce and sell our favorites varieties for your garden!